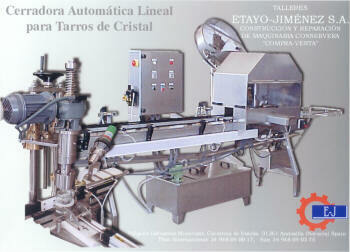 Navarra export catalogue - Talleres Etayo-Jiménez, S.A.
We to make known ours bottle-seamers adaptable any body format. We supplier of speare parts for ours machines. Other activity of the factory is to buy and to sale second hand machine. 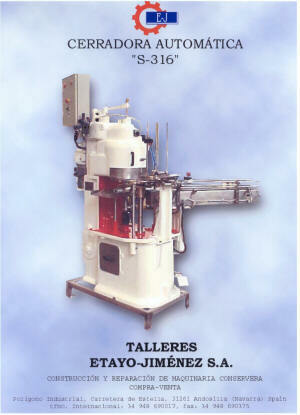 We have one extensive store of this type machine. This is overhaul in the ours Talleres completely. (as news). Ours machines have got the “(Marked CE)” acording to Directive 89/392/CEE and their modification. We have the privilege of to be Official-Agent of the Company SOMME by Navarra and La Rioja. All thi is back by one human-equipement hightly skilled which are enchantecl to attedn yours necessity.